Incentives encourage customers to remain loyal, as well as share their positive experiences with others, and recommend your products and services. Research has shown that tangible prize based rewards are viewed as a greater incentive than simple monetary rewards. When done well, loyalty reward programs keep customers coming back when they may not have, or they get consumers to revisit your business or service more frequently. Purchase Point Australia carefully brand customer loyalty cards and gifts to fit your brand and promote your corporate identity. 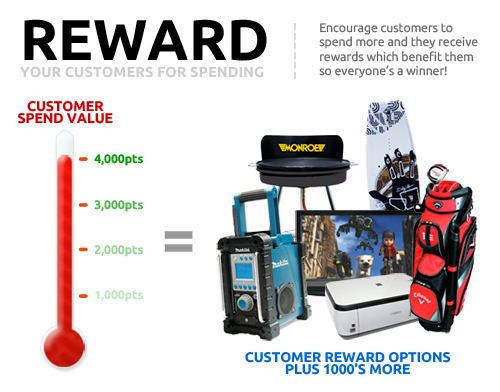 We can provide points-based systems for online or offline, manually administered reward programs. These can be based on a percentage of sales value, or with set points for individual products, enabling the rewards system to be measurable against sales profits. While providing a customised solution, Purchase Point rewards programs generally run off the same prize databases and distribution modules. This ensures production and administration costs are kept low so as to enable the maximum budget to be applied where it is most effective – the reward items themselves. We can also offer these programs for internal staff reward incentives, to encourage and recognise high performance standards, increase sales or provide exceptional customer service. Let us create a unique range of products that are highly desirable and watch your staff embrace this rewarding program. Contact the team at PPA today to find out how we can build you a customer or staff rewards program to increase your company performance.